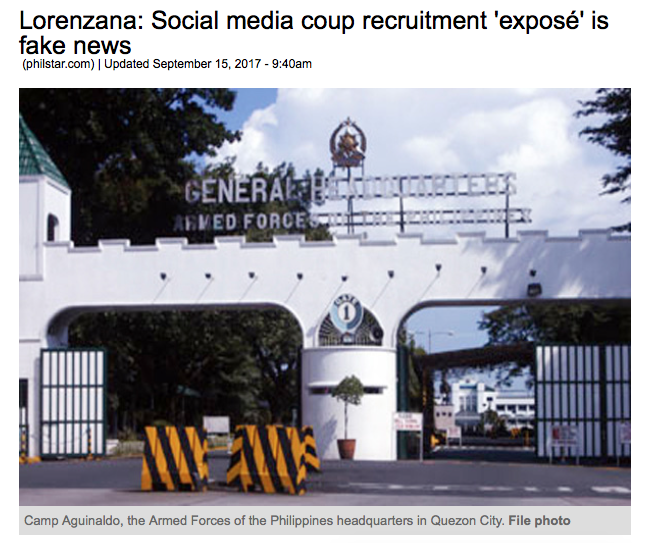 Fake news spread via social media is polluting discourse everywhere. 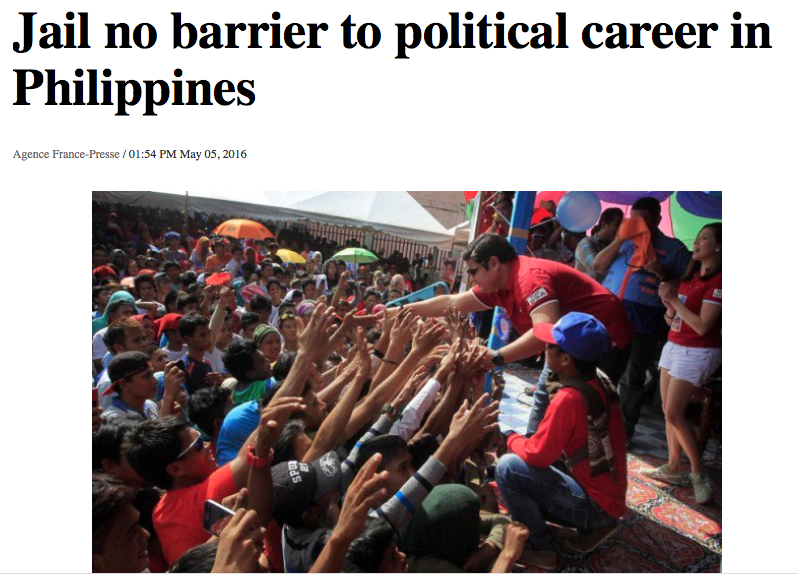 But in the Philippines it is an especially troubling problem. In the USA there are no Senators relying on Facebook posts or dubious news sources to inform them. 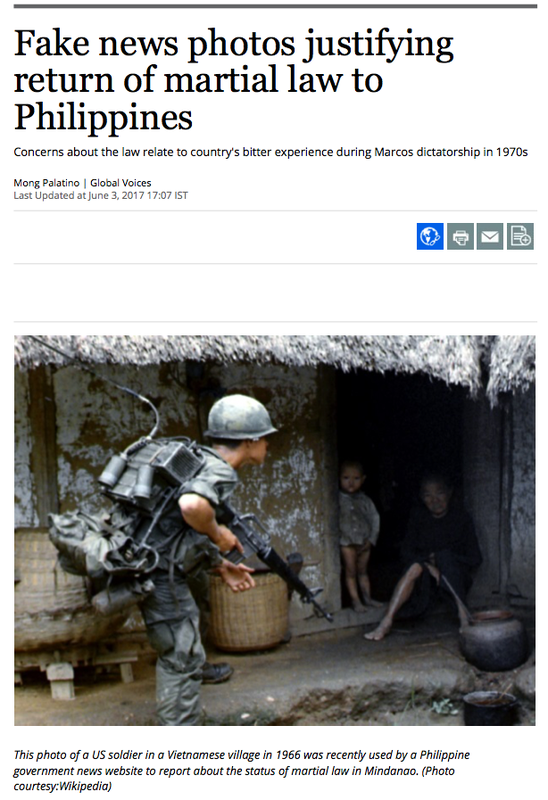 Certainly you won't find any U.S. 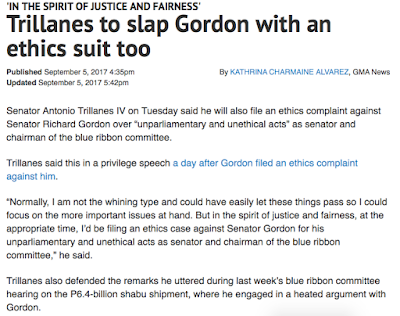 Senators accusing their colleagues of plotting their political demise based on some tweet or post. 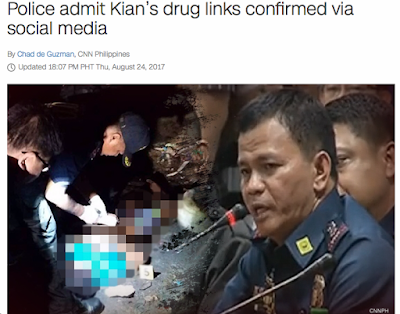 Senator Cynthia Villar on Wednesday said “someone from social media” warned her about two minority senators who have been plotting to destroy their colleagues in the majority coalition of the Senate. 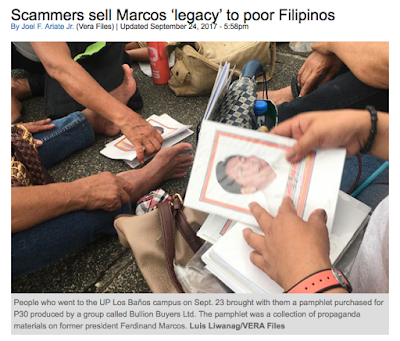 Villar later identified them to be Senators Bam Aquino and Risa Hontiveros. Both Aquino and Hontiveros vehemently denied plotting against the Senate majority. “I just want to make a manifestation. 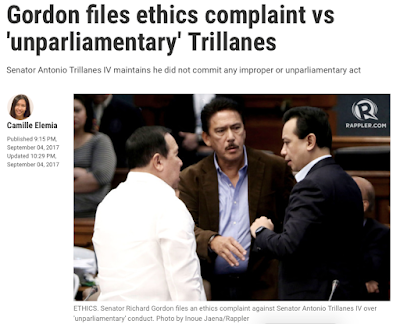 It’s really somebody from social media who told me before long time ago that there are two senators who are going to destroy us,” Villar said during the Senate regular session. First of all who talks like this? I want to make a manifestation? That is awkward and improper English. I want to make a statement. I want to make a disclosure. Both of those are correct. I want to make a manifestation? That is the speech of someone who is not very bright but wants to be seen as very bright. She is using big words because big words equals smart. If Sen. Villar wishes to come across as smart she would be better of shutting her mouth. Proverbs 17:28: Even a fool, when he holdeth his peace, is counted wise: and he that shutteth his lips is esteemed a man of understanding. Second of all she is making a damning accusation based on nothing more than a Facebook rumour. 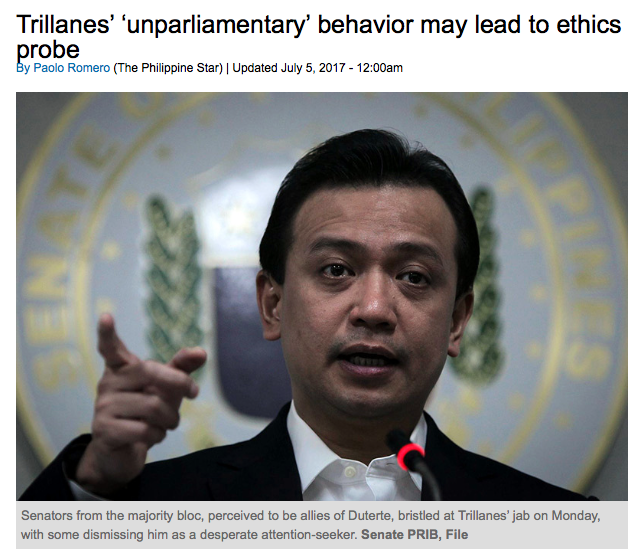 Who is this somebody who told Sen. Villar that two senators are going to destroy the majority? How long ago did they say this? 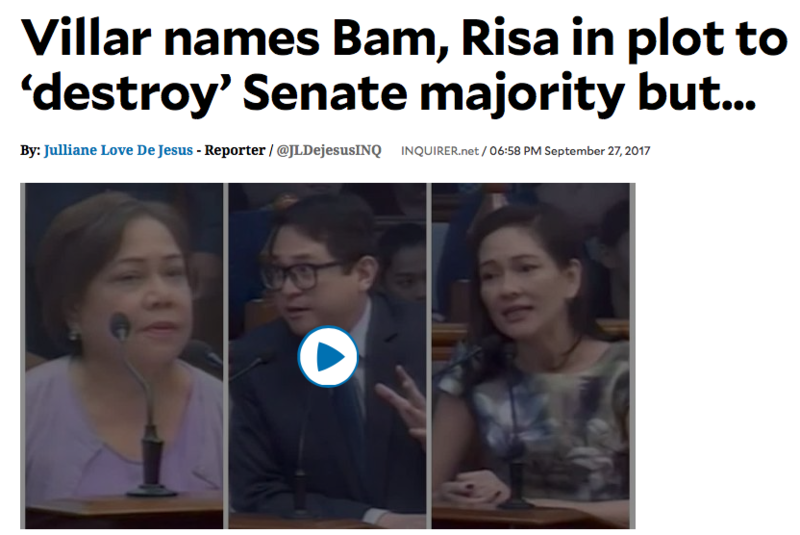 How exactly are two senators going to destroy the majority? 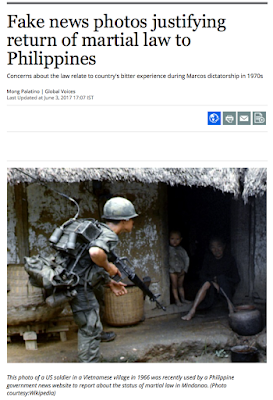 Let's read some more of this article and try to follow her logic and reasoning process. Before the session started, Villar said Aquino and Hontiveros were allegedly “out to destroy the majority.” The senator could not say what the intention was behind the alleged demolition job. 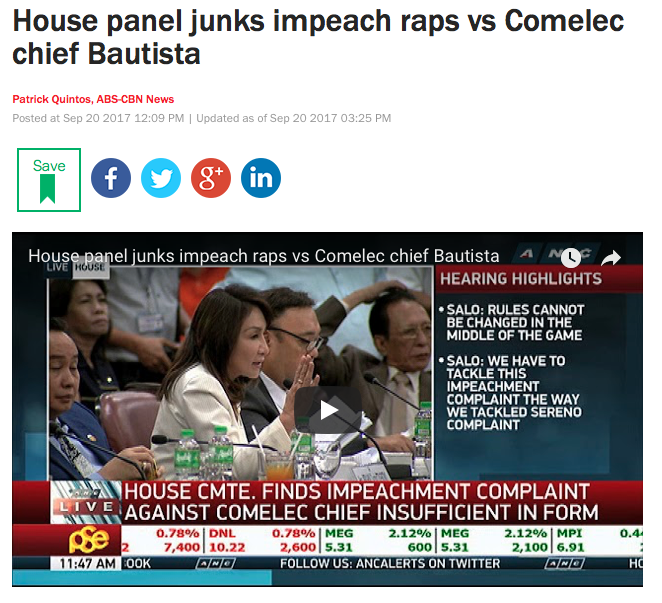 She said this as she lamented about the criticisms thrown at her and six other majority senators for allegedly not signing a resolution urging President Duterte to stop the senseless killings, especially of children and minors. 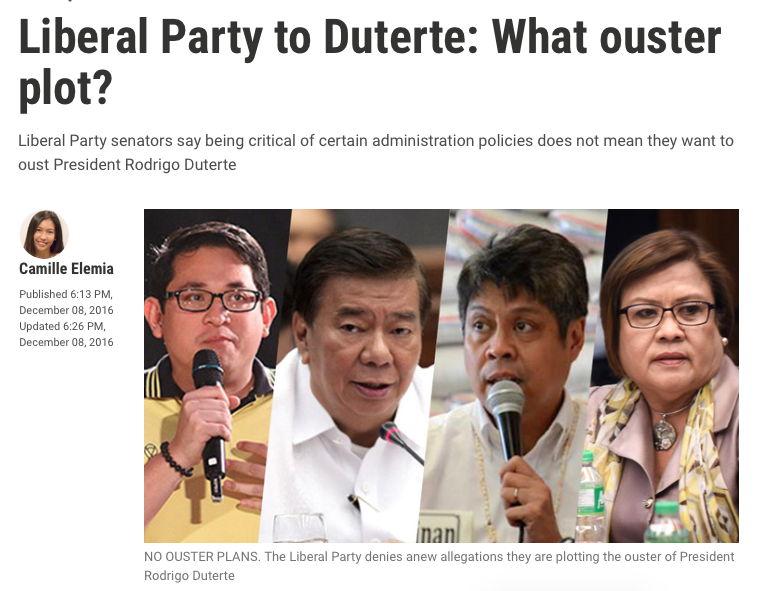 Villar and the rest of the six senators who did not sign the Senate Resolution No. 516, said the document did not reach their office. 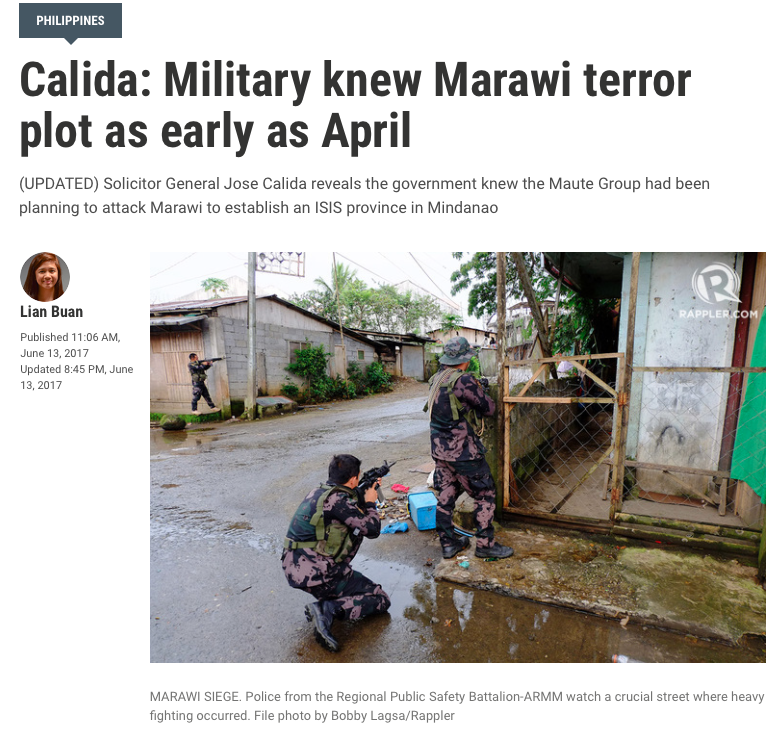 When the issue broke out, Villar said she surmised that “maybe this is the beginning” of the demolition plot. 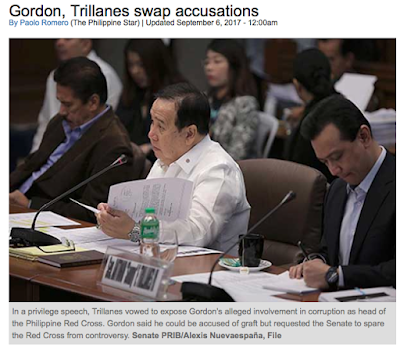 But later in the session, she said she did not believe the warning she has been receiving against Aquino and Hontiveros. “I didn’t believe it. 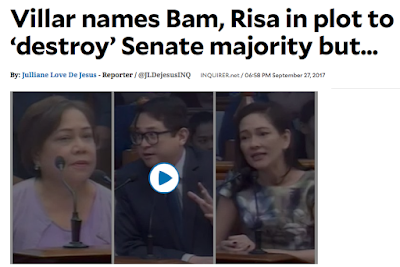 It’s just that when I saw that blog, then I started thinking that it was really true and I want to clarify with Senators Bam and Risa they told me really that Senators Bam and Risa are trying to destroy us,” she said. 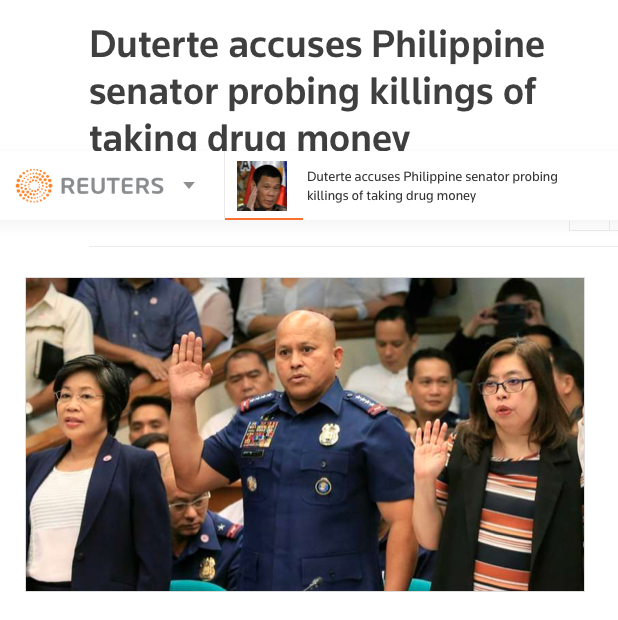 What happened is that a few Senators did not sign a resolution condemning the drug war killings. 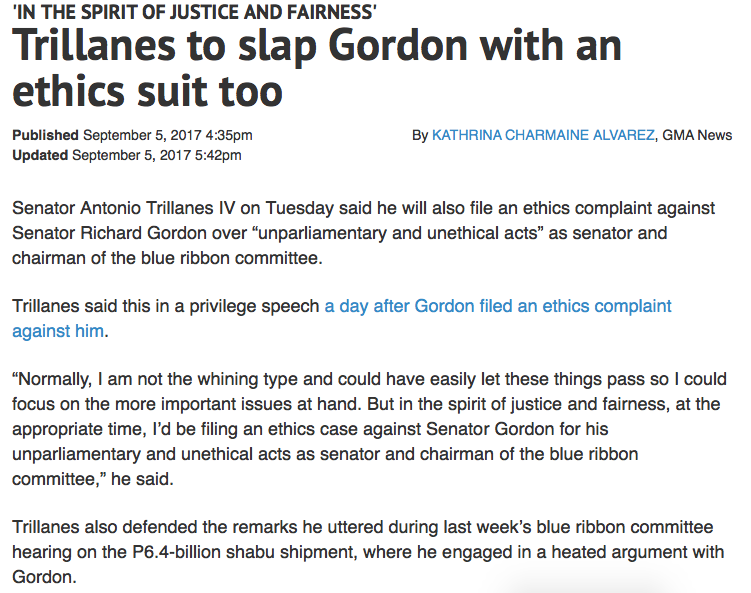 Those Senators were then criticised for this on a blog. Because Sen. Villar and the others were criticised she immediately thought "maybe this is the beginning" of a demolition plot that somebody on social media told her about "long time ago." And after airing her concerns that Aquino and Hontiveros are out to demolish the majority Sen. Villar claimed she does not even believe her own accusations are true!!! IF SHE DOES NOT EVEN BELIEVE IT THEN WHY DID SHE BRING IT UP????!!!!! 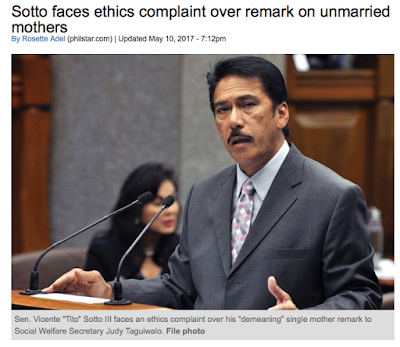 Dear reader, in the words of Sen. Villar, I want to make a manifestation. Philippine politics is a petty, no-good, circus side-show full of imbeciles, entertainers, corruption, and a blatant disregard for the best interests of the people in favour of the best interests of the politicians bank accounts. Sen. Villar and her ilk, which is to say every single one of her colleagues in the House, the Senate, and Malacañang is a retard. Not a progressive one in the bunch. 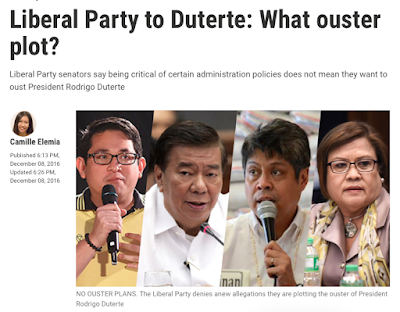 Every single member of the government from the elected official to the appointed bureaucrat is a retard holding back the Philippines from economic and social progress. 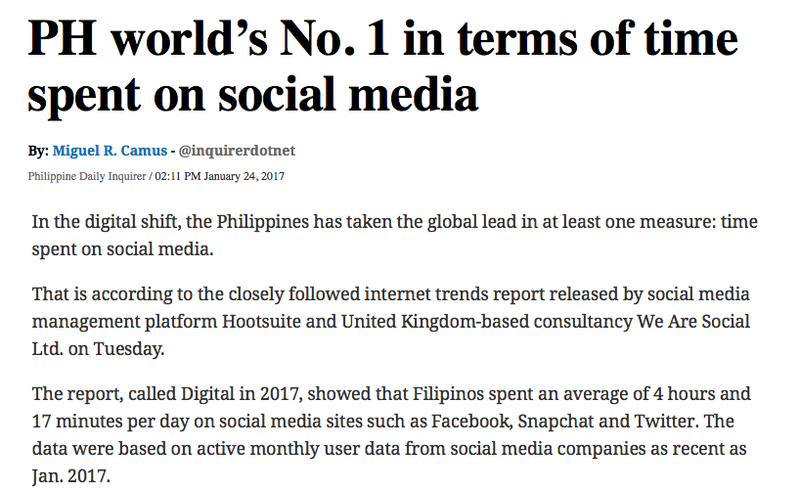 But truth be told Filipinos do not have much of any sense. 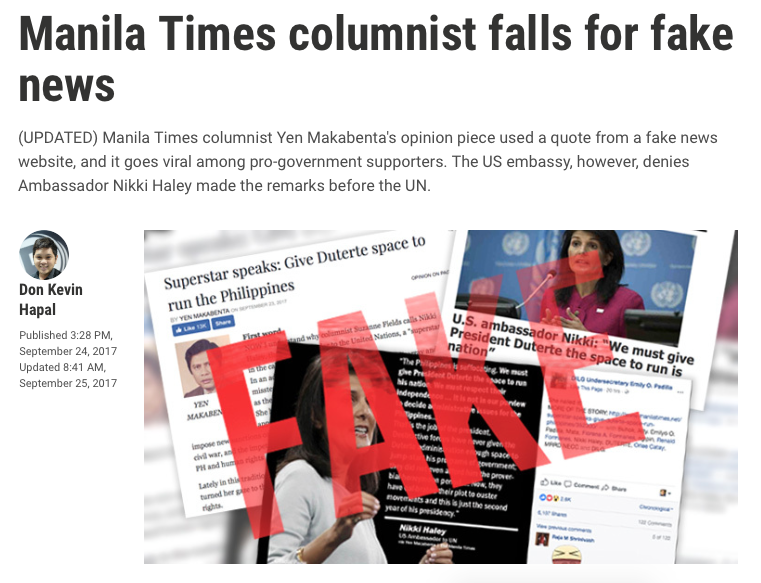 Sen.Villar is a reflection of the people who voted her into office and sadly Filipinos appear to be the most gullible people group on the face of the earth. Facebook only worsens the problem with people quickly able to spread lies which easily fool the people. 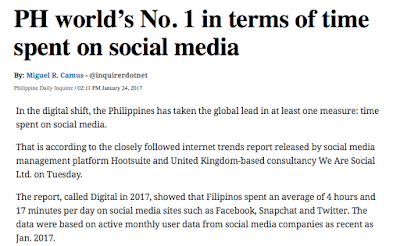 So much for gullible Filipinos who waste their time on Facebook sharing untruths. But how can they trust any source of information when even the mouth of the president is a fount of lies? 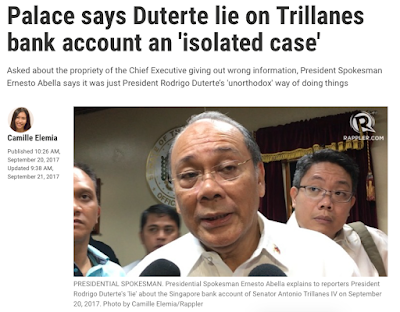 Also asked about the propriety of the President giving out wrong information, Abella said that it is just Duterte’s “unorthodox” way of doing things. 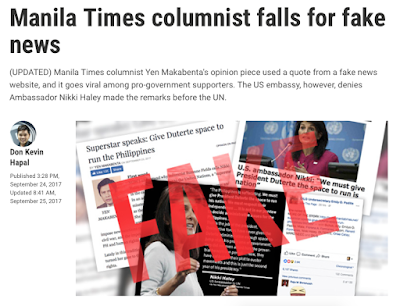 Duterte is not a liar. He's just unorthodox. But to be unorthodox is to be a heretic. To be a heretic is to espouse lies. 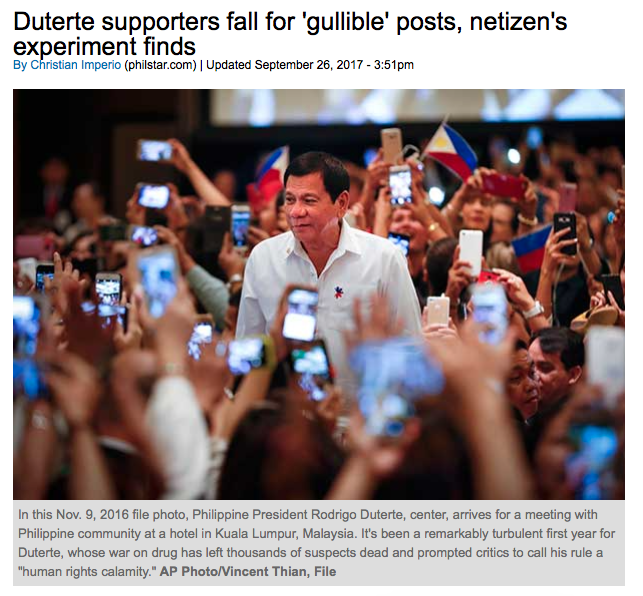 So in the end Duterte is a liar no matter what term they wish to use to clean him up. Duterte's methods are typical of Philippine politics. Petty, fearful, and ridiculous. Everyone is trying to oust everyone else. There is no reaching across the aisle. 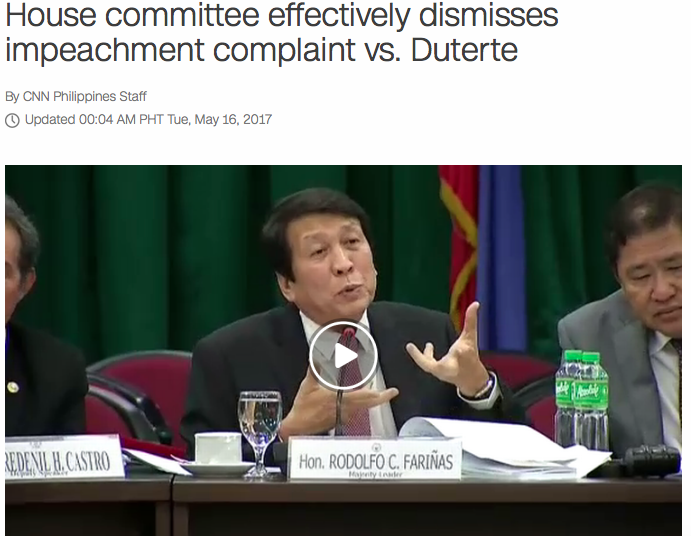 There are only calls for impeachment and accusations of graft, conspiracy, and unethicallness. Sen. Trillanes features prominently in most of the above stories but he is not the only politician accusing others of misconduct and filing cases here and there and everywhere and making a mockery of the government while claiming to be fighting the good fight against corruption. 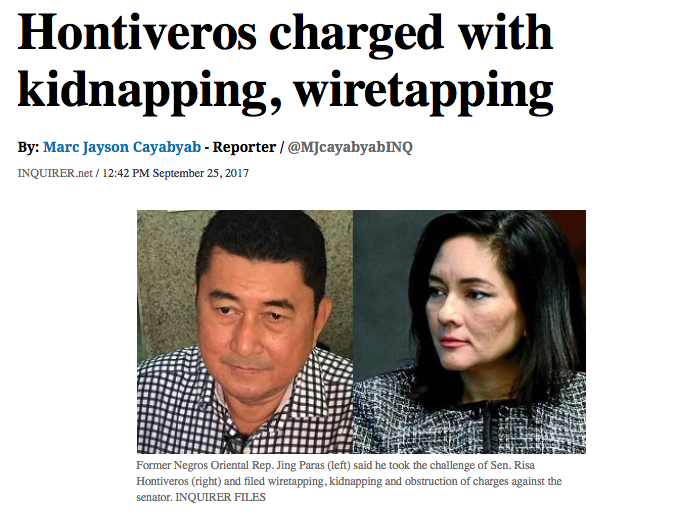 Sen. Risa Hontiveros has also recently had a complaint filed against her for kidnapping and wiretapping. 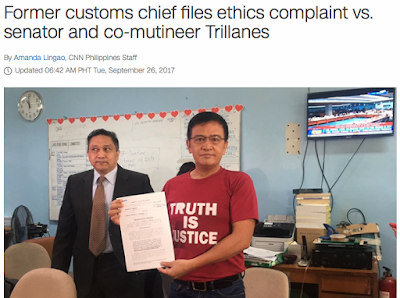 In an interview after the filing, Paras said he filed the complaint in response to a challenge posed by the senator. “Since she challenged us to file a case, pinag-aralan namin,” Paras said. Since she challenged us? It's all a game to these people. I dare you. I double dare you! Oh yeah! Same to you! 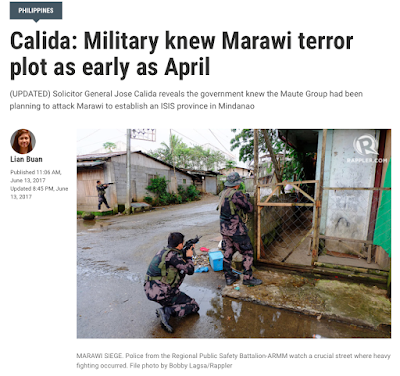 Well I triple double dog dare any Philippine Senator or member of the House to launch an investigation into the government's prior knowledge of the Marawi siege. Go ahead. I dare you! Do it! What are you, some kind of chicken? Bawk-bawk-bawwwwwwk!!!! 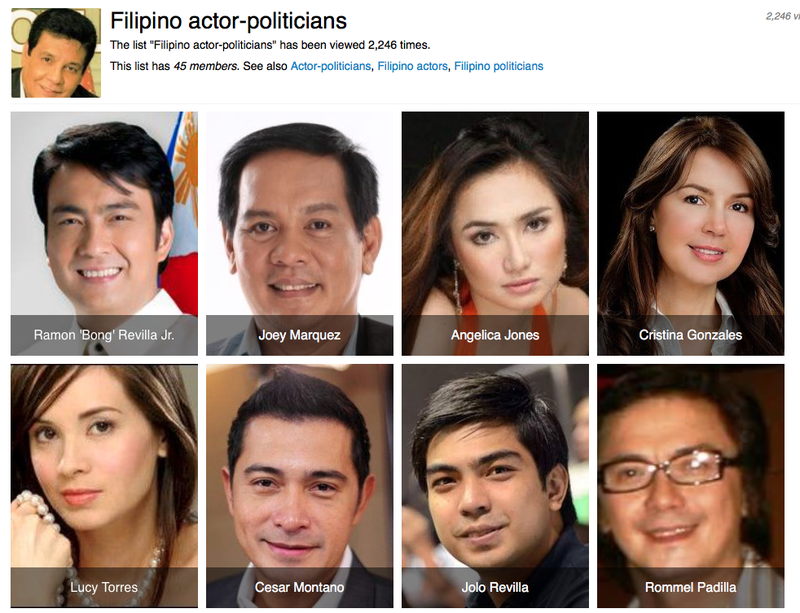 It's all to be expected from a nation where any actor with no training in the law or politics can run for office and win simply because he or she were part of a popular love team everyone loves. Or where convicted felons can openly run for office and still have the support of the people. The following last bit of information is from 2013 and concerns the 2012 elections. But what has changed substantially in 5 years? 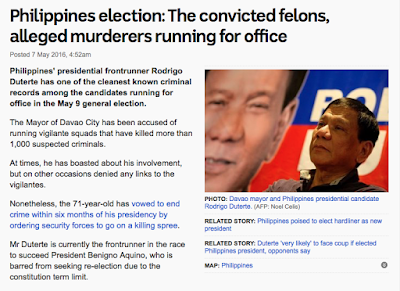 Has a system been set in place to weed out convicted criminals and those with criminal cases against them from being able to run for elected office? 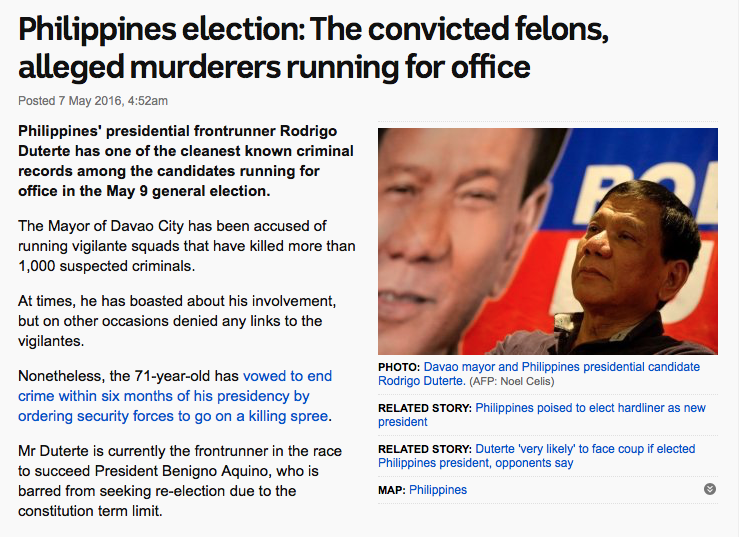 For all Duterte's talk about rooting out corruption has he even broached this issue of criminals being allowed to run and be elected to office? 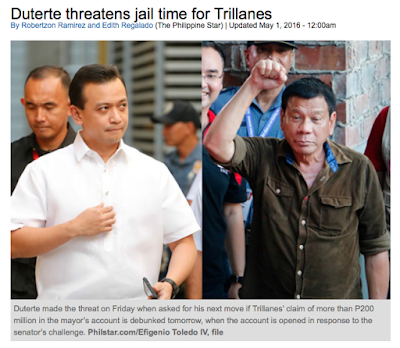 What kind of nation is it when criminals are allowed to run the government? The database of the Sandiganbayan anti-graft court on cases filed from 1979 to 2012 shows that at least 504 candidates who ran in last month’s elections are respondents in 1,883 cases for graft and other crimes. Of the 504 candidates with cases, 256 were elected or re-elected in the latest balloting, which drew a total of 45,147 candidates for all positions. 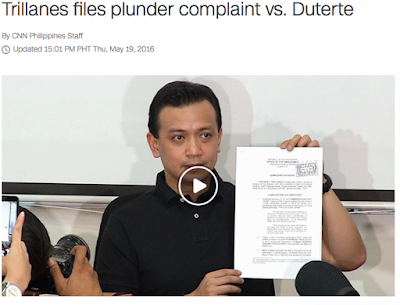 The charges against the 504 candidates range from plunder to malversation of public funds, usurpation of duties, giving undue advantage to favored or unqualified private parties, soliciting gifts in exchange for favors, and entering into contracts disadvantageous to the government, among others. A handful of other cases imputed grave crimes against these candidates who are supposed to combat crime: unlawful arrest and arbitrary detention, threat and coercion, physical injuries, obstruction of justice, bribery, estafa, malicious mischief, slander, nepotism, illegal use of alias, and even robbery, homicide, and murder. Of the winners, 17 had been convicted, while six others had pleaded guilty of the charges leveled against them. On appeal, however, the Supreme Court subsequently acquitted five of the 17 convicted. 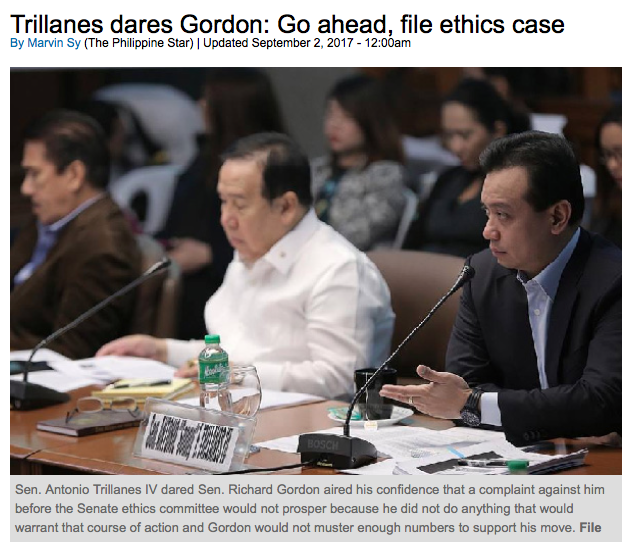 In separate rulings though, the high court and the Court of Appeals sustained the conviction of three other candidates. Of the accused, at least 256 won elective positions, including 19 who ran unopposed. They are respondents in 1,124 cases before the Sandiganbayan. 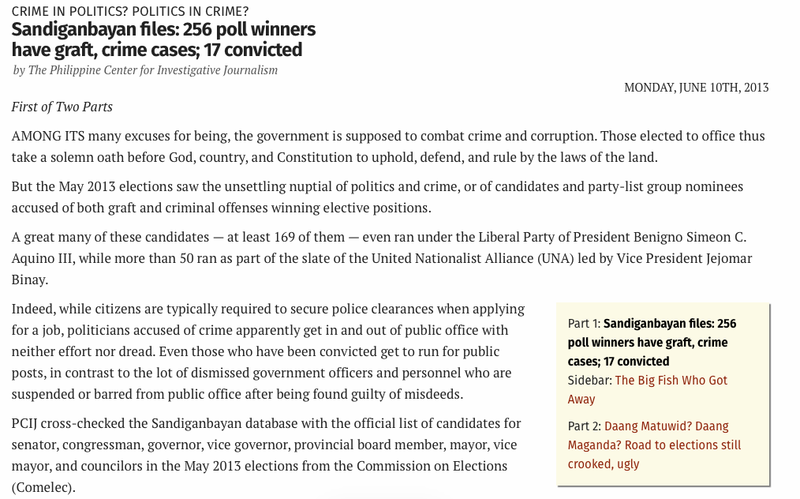 Among the winners, too, are 77 more candidates with pending cases and still undergoing trial before the Sandiganbayan. 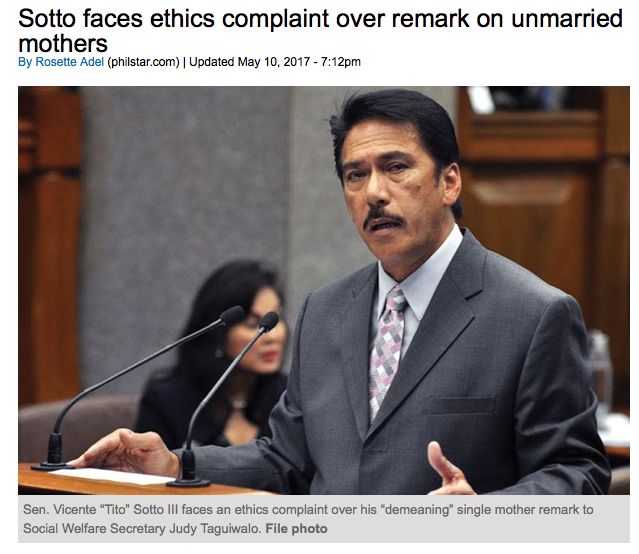 Philippine politics is beyond a joke. And the people love to have it so.